As a young school girl or atleast until we made our trip to Rajastan, I always had visualized desert to be covered with sand dunes, scorching heat, no vegetation, shortage of water, people commuting on camels etc – probably that’s what I had learned in geography in my school days. I was wondering how anyone can live there! Can anyone lead a comfortable life in desert?! No comfort, no happiness was my notion. 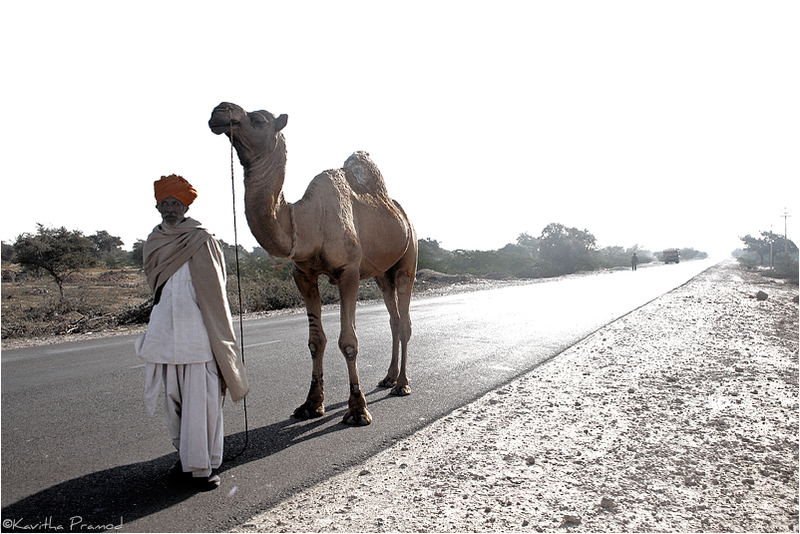 I reluctantly said “OK” for our trip to Thar Desert. Our plan of stay in an arid region was somewhat bothering me, although as a tourist. I made a lengthy to-carry list – water bottles, sun screen lotion, comfortable shoes, sun-hat, anti-dust-allergy tablets, first-aid box etc, etc, etc. The only reason I told yes to this trip was, I wanted to do lots of shopping. I had heard that Rajasthan is famous for hand crafts like jewelries with beautiful kundan works embossed on jhumkas , bracelets, bangles, earrings, nath (nose ring) . Designer Jutis made out of camel leather. Flaming Bandhani designs on sarees, salwars & chunris. I thought of visiting forts, coming back with lots of pictures to show off :). Yes, that is how most of us are – we think we are happy being in a comfort zone. However, what I underwent during my trip was totally a different experience altogether. It was during winter we made our trip to Thar Desert. Days were hot and nights were cold. 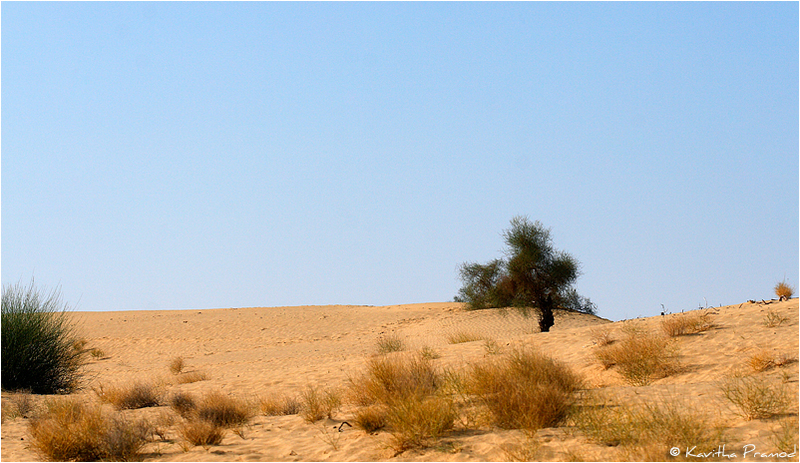 Landscape had no regular pattern throughout the Thar Desert except that it was completely a barren land. 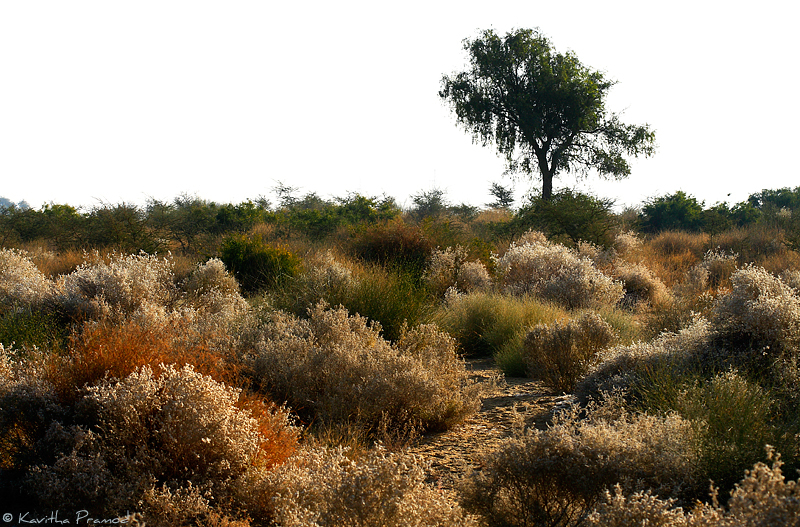 While some regions covered with fragments of rocks, shrubs and dry bushes of golden or white color, some regions had only cactus, some had hillocks and dry trees and in few regions it was sporadic trees and small mounds of sand amidst them . In some places, vast area was covered entirely with sand dune. Golden color dunes of different shapes (crescent, linear, dome etc.) and different sizes, shallow and deep, crests and troughs, wind-caressed ripple formations , pristine undulation patterns, footprints of camels, sheep and chinkaras , foot wear marks left behind by humans too, were present. Indeed, we witnessed human elements all along the natural landscape. Yes, there were people living in the arid region, many people! They were tribes, they were cameleers, they were cattle rearers, they were farmers, they were nomads, they were homemakers, they were traders, above all, irrespective of who they were, they seemed happy. 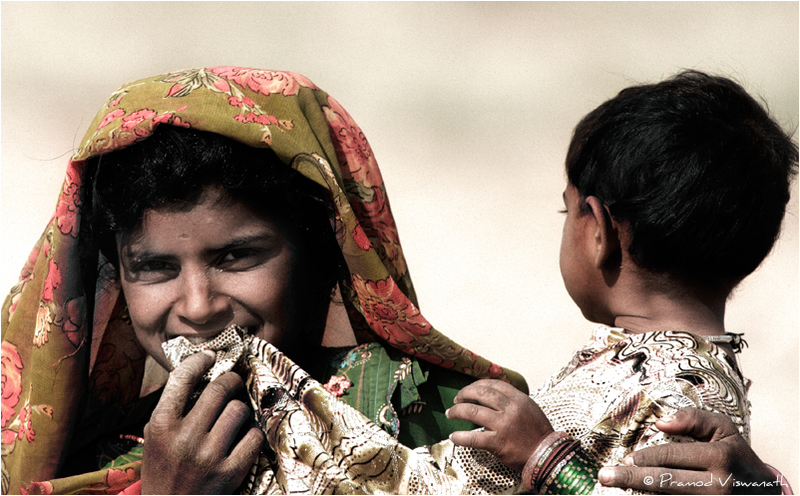 Despite of their own problems, villagers in Thar Desert seemed to be at peace unlike the tension-filled faces that we see in cities. 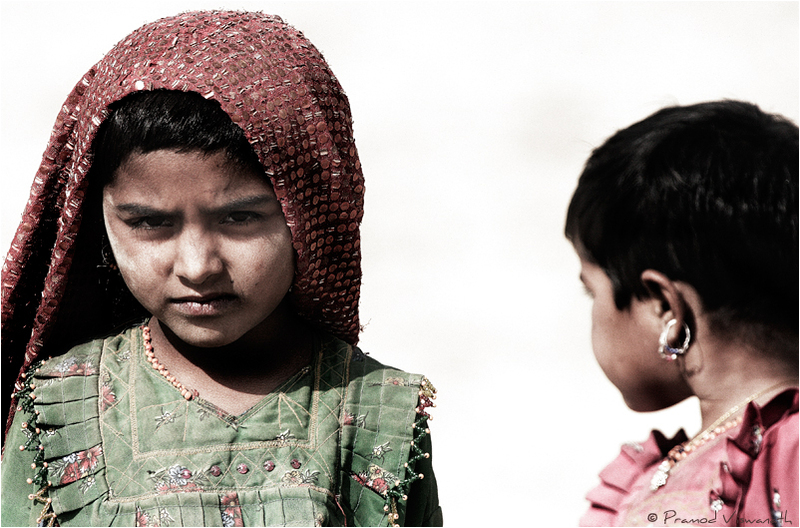 I did not find any regrets in their eyes for living in desert. They seemed not to be much concerned about the scorching heat, about the drought-prone land, about the scarcity of water, about the sand storm or about any other so-called day-to-day difficulties they face in desert. 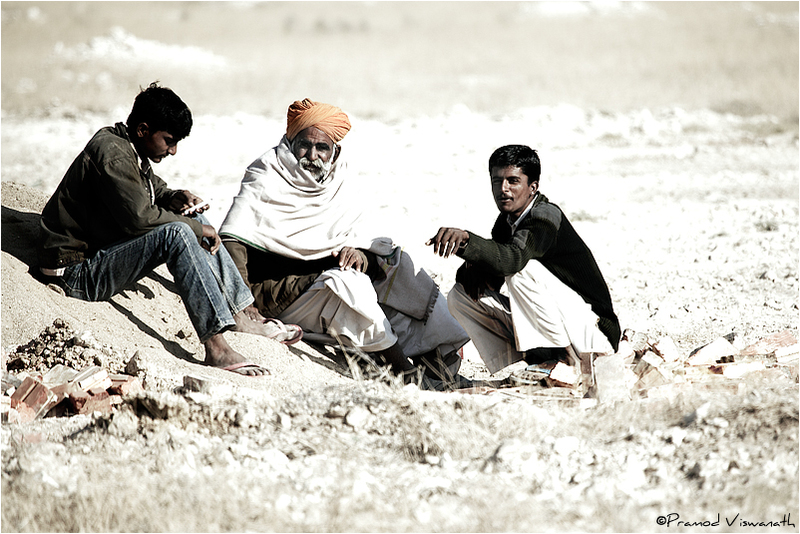 Throughout my travel on Thar Desert, I kept observing these villagers and was constantly asking myself – “Is it not hard for these villagers to accept the ruggedness of the desert?” While we see people from city crib for every small thing, people in desert seemed to be happy without having even the basic needs! 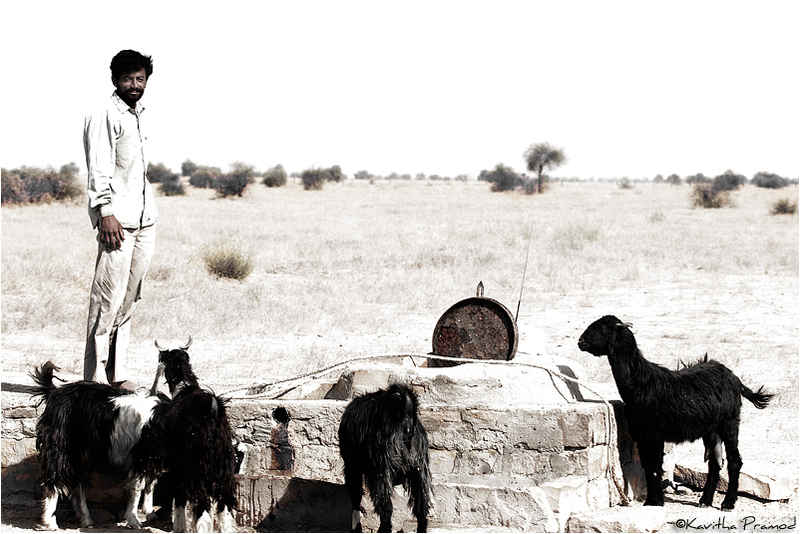 As tourists, we were niggardly using water – thinking twice even to drink a drop more, worried about the scarcity of water in desert region, this man seemed to be quenching the thirst of animals, happily! Was it because, he had tasted a similar insatiable thirst before? Living in big cities, having all comforts in life. while we hardly make time to converse with the family/neighbors; these villagers were having a casual conversation under the scorching heat (remember there was no shade for next 2 kilometers!). Even the younger ones seemed NOT to be complaining about the harshness of the desert. There was no sign of tiredness in the face of this man who had walked a very long way with his companion. Why do WE THE PEOPLE from city strive to attain happiness? Why do we have misconception that happiness lie in earning more money, in owning a big car, residing in big & beautiful house, in reaching the top most position in work place or in leading a luxurious life? As I read recently somewhere “Being happy doesn’t mean that everything is perfect. It means that you’ve decided to look beyond imperfections”. Is it not that Happiness lies within us and the way we look at the world? Wise thoughts…Nice pics…..You are absolutely correct, Happiness lies within us and the way we look at the world…..Good going Kavi….. This is certainly a nice travel writeup. I could imagine myself in Thar as I read through it. Photography – No comments – I am sure your photographer will be happy about your photography ha ha :). I would be curious to know about the crafts and other stuff(along with photographs)which you mentioned at the beginning. And a bit of about their education.